The Dragon God protects Minuma ! 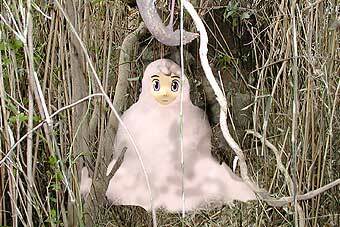 From a NHK program in September 2006. The area of Minuma in Saitama Prefecture is known for its belief in the God of Water (suijin), or rather the Dragon God (ryuujin). Here is a map of the area, which was a swamp in olden times and has been used for various agricultural cultivations since time of the eighth shogun, Yoshimune. 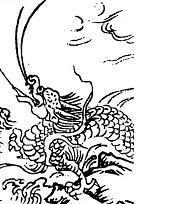 The Legend of the Dragon God. The Hall of Dainichi Nyorai (Dainichi doo 大日堂) became the headquaters of the officials in charge of the water works in the swamp during the Edo Period. One night a fair maiden appeared in the dream of the official in charge, one Izawa Yasobei, and told him she was the Lord of the Swamp. She asked Yasobei to postpone the constructions for 99 days in respect of the Lord Dragon God (which was herself) . After all, Yasobei had never asked her permission or given the Dragon God advanced warning to look for anothe place. But the official had to follow his orders and work proceeded. Then Izawa fell ill and the works had to be stopped. Again the maiden appeared in his dream and asked for postponement. She would heal him if he agreed. One day, when a servant peeked in his room, he saw his sleeping master, but next to him a white snake with a huge grinning open mouth, blowing fire on the sleeper. When he told his master, he immediately relocated the headquaters of his work force to another temple (Mannen-Ji 萬年寺) near Omiya. 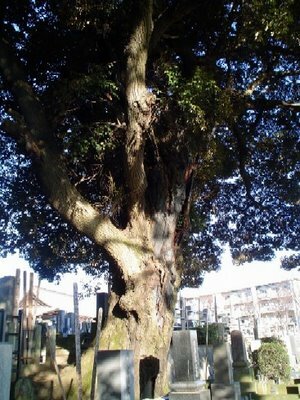 The great tree (Castanopsis) in the compounds of the Dainichi Hall is a protector deity and prayed to for fertility and childbirth. In a corner of the compound is a small shrine where the villagers pray to the Dragon God of the area for good harvest. Prayers also heal some coughing illness and when people are healed, they bring a rice ladle to the shrine as a thank you present (shamoji sama). 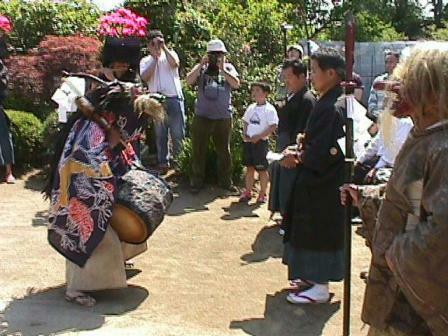 Nowadays, the ground around the Dainichi Hall is the playground for the local children and a festival in honor of the Dragon God is held there every year. Head like a camel, eyes like the demon, ears like a bull, horns like a deer, body like a snake, scales on the body like a carp, hands like a tiger and claws like a falcon. This is but one example of how our people managed the land to protect it from water hazards, whether overflowing rivers or high tides, making it habitable. As a consequence of similar interventions, (fig-3) 50% of all Japanese live on the alluvial plains which representing 10% of the country’s land area and where 75% of the nation’s assets are also concentrated. Since the shogunate was established in the beginning of the 17th century, Edo became the preferred residential site for the shogun, some feudal lords and their vassals and families, as well as Buddhist monks and Shinto priests, and merchants, tradesmen and artisans. A century later, Edo had a population of over a million. Needless to say, there was a need to supply the large population of consumers. Goods supplied by sea from the commercial city of Osaka filled the gap but the newly developed agricultural hinterlands of Edo contributed as much. At the time of the 8th shogun, Tokugawa Yoshimune (who lived from 1684 to 1751 and ruled from 1716 to1745), it was decided that new cultivatable land would be developed because the shogunate needed increased revenues. The possibilities offered by the Minuma Tamei reservoir could not be overlooked, and land reclamation by drainage was begun. The 8th shogun, who came from present day Wakayama Prefecture, appointed Izawa Yasobei (born in 1654, died in 1738), an accountant of the shogunate and a civil engineer by training, to direct the design and operation of the plan. So, a 1,200 hectare rice paddy emerged where the 1,200 hectare reservoir had been. (fig-6) The embankment of the Minuma Tamei reservoir was demolished and the water was drained to the Arakawa River via the Shibakawa River (formerly a drainage canal). After the reservoir was drained to create new rice paddies, there was a need to tap another source of water for irrigation. 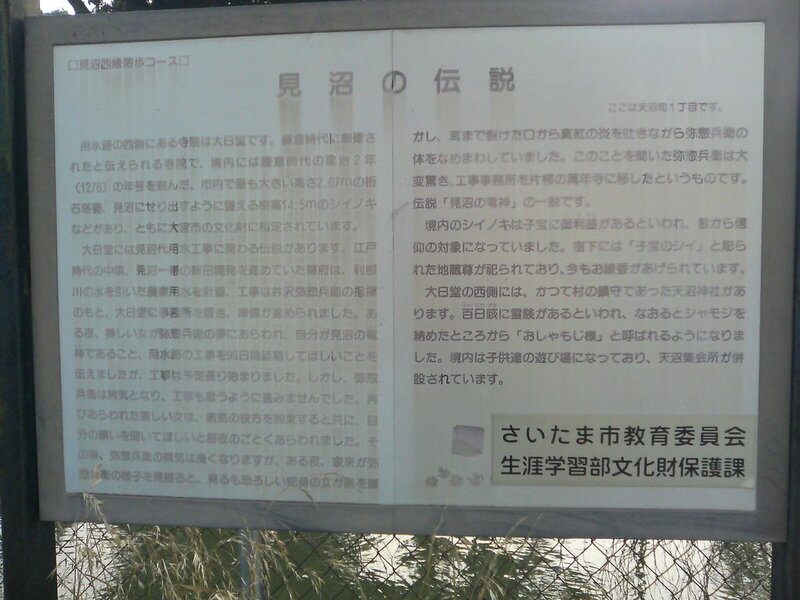 For this, water would be drawn from the Tonegawa, and a 60-kilometer irrigation canal was constructed. 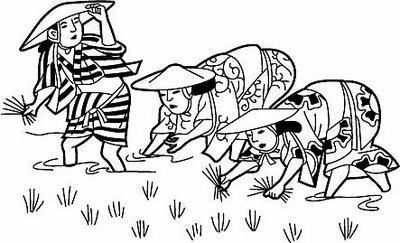 The shogunate thus obtained sufficient water to irrigate a new area of paddy as well as the existing rice fields. 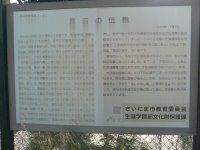 The canal was called Minuma Dai-yosui - the Minuma Substitute Irrigation Canal. Rice yield doubled with the completion of the canal compared to when the Minuma was marshland. 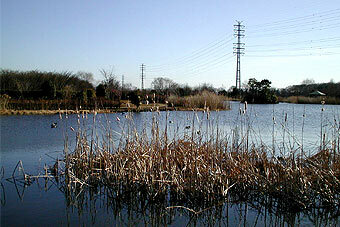 At the same time, marshlands along the canal were also developed to become one of Japan's major rice-growing areas. Covering 15,000 hectares, it is known today as the Minuma Rice Fields (Minuma Tanbo). Izawa Yasobei’s method of draining the marsh and digging a new canal and of separating irrigation water from waste water, was called the Kishu (Wakayama) way in contrast to the Kanto Way. The canal was dug in 1731 to enable the passage of vessels between the drainage canal, the Shibakawa, and the two irrigation canals to the east and the west(fig-8). Japan’s first wooden two-stage lock gate was installed to solve the challenge of the 3-meter water level differential. Unfortunately, this lock gate has not survived. What we have today is a replacement. The barge canal, which overcame the 3 meter difference between the irrigation canals and the Shibakawa, became the most important means of transporting produce and other goods to and from Edo and the Minuma region. It was used mainly in winter when irrigation was not needed. Rice, vegetables and timber were shipped out of the Minuma fields. From Edo went fertilizer, soy oilcake, fish and salt. Its most important export was fertilizer, which in those days was night soil. It was called ‘golden fertilizer’ and was handled with respect. A special barge was built to transport this valuable commodity. Today, we would say it was recycled (fig-9). The golden fertilizer barges were in service even up to the Showa era (1926-1989). Let me discuss the mechanical aspects of the Minuma Barge Canal (fig-10). 1) Two lock gates were built to overcome the 3-meter difference in the water levels of the Shibakawa River and the irrigation canal. 2) When the vessel passed through the first lock, manpower was used to pull the boat through the swift water of the canal (fig-11). 3) When the boat had passed the first lock gate, boards were placed to raise the water level. I will show you how it works (fig-12). A wooden board is thrown into the canal. The flowing water takes the board to the two pillars of the lock gate. The board has a handle that is caught with a long hooked rod and manipulated using the force of the water to a horizontal position between the two pillars. The procedure is repeated until ten or so boards are in place one above the other. 4) The water level is thus raised high enough for the vessel to pass the second gate (photo-6). To lower the water level, the boards are removed one at a time by catching them with a hook as before (fig-13). Unlike the lock gates in Europe that are mechanically opened and closed, the manually operated system is uniquely Japanese. The Minuma Vessel Lock Gate is one that makes a unique contribution to world history. Ensuring drinking water for its large population was a major challenge for Edo. The difficulty of penetrating the hard ground of the Kanto Plains was a formidable obstacle to exploiting the use of underground water. In the days when power was not available it was difficult to draw a large quantity of water from a nearby river as levels were usually too low. Water for drinking and household use therefore was drawn from lakes or farther upstream. The Kanda waterworks in Edo (fig-14) drew water from three lakes, Myoshoji, Zenpukuji and Inokashira, and supported the life of the Shogun and the city population. Later, in 1654, the Tamagawa brothers operated the Waterworks drawing water from the Tama River. The water was abundant and was transported in an open channel over 43 kilometers from Hamura on the river where it was drawn to Yotsuya-Okido. At Senkawa and at other locations the water was diverted in catchments to supply the citizens of Edo, and without any doubt, contributed to the city's growth (fig-15).